After creating a flutter with his comments on Tuesday that MPs grasped very little about the implications of the National Judicial Appointments Commission, Ram Jethmalani went one step further in his defence of the collegium system and asserted in his (written) response to the written submissions of the Attorney General that he has not seen a single judge who can be compared with the worst judges produced by the earlier system. He was appearing for intervener Advocate Ashish Dixit. Mr. Jethmalani also contended in his written response that the system which was being followed before the Second Judges case, was a system which produced the atrocious Jabalpur Judgement and the minority judgment in the Keshavnanda Bharati’s case and that the collegium system created by the second and third judges case is a vast improvement. “The AG with his private knowledge about bad judges is entitled to have his own opinion but speaking for me, I have not seen a single judge who can be compared with the worst judges produced by the earlier system. The personal assertion of the AG is not supported by any admissible evidence and cannot influence the decision of this case,” said Mr. Jethmalani. Even as Mr. Jethmalani stoutly defended the collegium system and steadfastly opposed the NJAC, the Supreme Court on Friday opined that the new National Judicial Appointments Commission Act (NJAC) which regulates the process of appointment of judges should not be seen as "good or bad" and rather tested on the proposition that whether it conforms to the basic structure of the Constitution or not. "Don't put the new law as good or bad. If it meets the parameters of the basic structure, work it out,"
a five-judge Constitution Bench headed by Justice J S Khehar observed during the course of arguments on the constitutional validity of the National Judicial Appointments Commission Act (NJAC). The Court made the observation when senior advocate Rajeev Dhawan Dhawan opposed Centre's submission that NJAC had an element of "hit and trial" and it will have to be seen how the new system works. "The 99th amendment is a thoughtless piece. Constitutional amendments are not made for trial. It is too serious an issue and cannot be left to hit and trial. It cannot be put on experimental basis. We cannot experiment with the Constitution," Dhawan had said opposing the NJAC Act. Contending that the independence of judiciary is inextricably linked with the appointment process, he said the independence of judiciary cannot be maintained when the power to appoint judges rests with the executive. "Why are we eager that there must be a reform. Everything is not vulnerable to change. What is the compulsion for the change. I agree, at the maximum, there might be a body to look into the performance of the judges. But, not beyond this. "The collegium system was working perfectly. Appointment of judges is not a thing to be played in the hands of the Parliament. What is the basis of making this change," Dhawan told the bench, also comprising Justices J Chelameswar, M B Lokur, Kurian Joseph and A K Goel. Upon hearing this submission, the bench remarked (ostensibly responding to Mr. Ram Jethmalani’s submission earlier), "it was pointed out no Member of Parliament understands what NJAC is all about. The fact that NJAC was passed unanimously by both Houses of Parliament shows they all were in agreement. We cannot interfere in this. They are elected representatives". During the proceedings, Attorney General Mukul Rohtagi also countered the submission made by Ram Jethmalani that MPs were not aware about the new law and said it was a "dangerous" proposition to say that MPs don't understand NJAC. Member of the Rajya Sabha and senior advocate Ram Jethmalani on Tuesday had questioned the understanding of politicians, saying MPs grasped very little about the implications of the National Judicial Appointments Commission (NJAC) before voting unanimously for it. Earlier, Mr. Jethmalani in his written response to the submissions made by the Attorney General (AG), tore into the arguments of the AG and offered a para by para rebuttal. In particular he took exception to the presence of the Law minister in the NJAC and said “The law minsters presence with a vote and the power to canvas with other members of the commission with the enormous resources of the state behind him, unfortunately creates a reasonable apprehension in the mind, of a fighting the government before a judge who got appointed with the vote of a Cabinet Minister may well feel that the judge will be reluctant to displease the government. The Minister is likely to defer to the executive interests and desires. His participation in the appointing process is highly likely to destroy or diminish his confidence of the litigant in the administration of justice.” Mr. Jethmalani also raised a contention that if the Law Minister has expressed himself in the matter of appointment, it is in violation of the separation mandated by the Article 50 of the Constitution. “Merely because the present system is the result of the second and third Judge’s cases, it does not mean that the five Judge bench can sanction a Law which interferes with the basic feature of the Constitution. It is basic, not only because it is declared basic but because it was intended to be basic when the Constitution was framed and passed,” added Mr. Jethmalani. 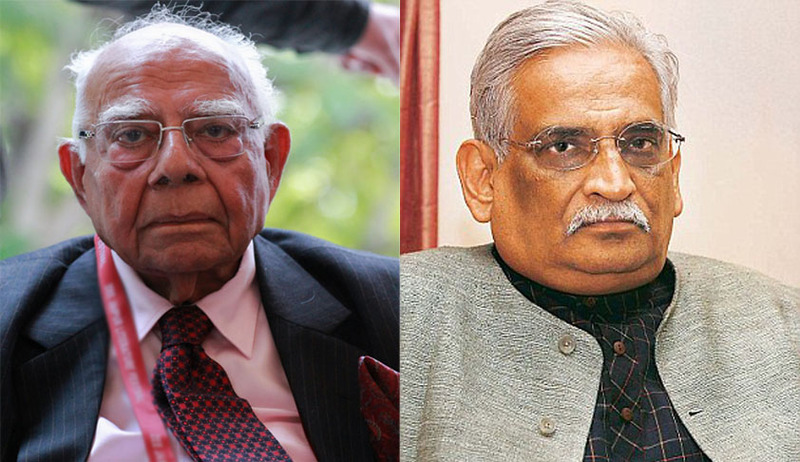 Read the Jethmalani’s written response to AG-Part 2 & 3.